Laparoscopic surgery has been established as a preferred method of surgery in almost every field of elective surgery. The unique benefits of this minimally invasive technique in both peri and postoperative period are now well recognized by the surgeons as well as by the patients. Many complex procedures are now performed laparoscopically than ever before. Emergency surgeries are also not left behind. Its role in emergency surgery is also rapidly gaining momentum amongst many general and laparoscopic surgeons. Although surgeons have been using laparoscopy for adhesive small bowel obstruction for quite some time, its exact role in this management is yet to be established. Different case series have documented various degrees of success. However, in all of these series immediate open conversions were performed, once gangrenous bowel was found on diagnostic laparoscopy. To the best of our knowledge, emergency laparoscopic resection of gangrenous small bowel for intestinal obstruction has not yet been reported in the English literature. Open conversion still remains the standard approach. We here by reporting the world’s first case of successful laparoscopic resection of gangrenous small bowel in a patient presented with acute small bowel obstruction. A 64 year old woman presented to our accident and emergency department with one day history of central abdominal pain and vomiting. The patient reported that her condition had worsened over the last 6 hours and had not passed any flatus for the last 24hrs. The patient gave no history of change of bowel habit (COBH) or any other constitutional symptoms suggestive of colorectal tumors. She was hypertensive and had no previous abdominal surgery. On examination in the Accident and Emergency department, the patient was comfortable and her mucous membranes were pink but dry. She was normotensive with a pulse of 84 beats per minute and her SPO2 was 98% on room air. Abdominal examination revealed mild central abdominal distension with moderate tenderness in the epigastric region on palpation but there was no guarding or rebound tenderness. There was no palpable mass or hernia noted. Digital rectal examination was normal. Blood investigations revealed an elevated WBC with a normal Hb and a normal renal function test. Plain abdominal radiographs demonstrated dilated loops of small bowel. A CT scan of abdomen and pelvis with intravenous contrast revealed small bowel obstruction with dilated proximal and collapsed distal small bowel. 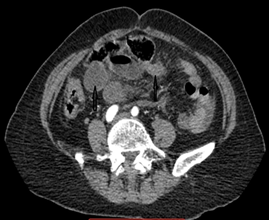 The CT scan also showed moderate free fluid in the abdomen but there was no radiological evidence of any ischemic bowel or any free air ( Figure 1 , Figure 2 ). 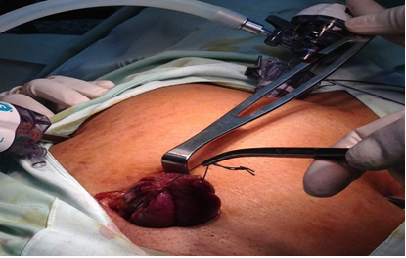 After adequate resuscitation the patient was consented for emergency laparoscopy. Under General anesthesia with the patient in supine position, the abdomen was clean and draped. 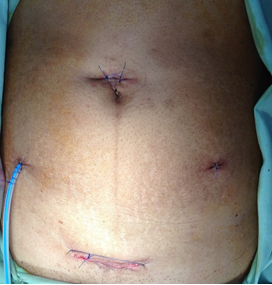 Pneumo-peritoneum was created up to 12 mm hg with open Hasson technique via a supra-umbilical incision. At laparoscopy a loop of gangrenous proximal ileum was noted with dilated proximal jejunum and collapsed distal ileum ( Figure 3 ). There was moderate amount of blood stained free fluid in the abdomen and pelvis. Three other ports one 12 mm port in supra-pubic area, one 5 mm port in left lower quadrant and one in right flank were inserted under direct vision. Free fluid was aspirated and the small bowel was followed carefully in a retrograde direction from the ileo-cecal junction serially towards the point of obstruction. A single constricting band was noted from the mid transverse colon to around the loop of proximal jejunum. The adhesive band causing the compression and ischemic necrosis of the segment of ileum was first released and wait for sometimes. However, the bowel failed to return back to its normal colour and there was no visible peristalsis ( Figure 4 ). Decision was then made to proceed with laparoscopic resection and anastomosis. Approximately 30-40 cm of necrotic small bowel was resected with 45 mm endo GI stapler and mesenteric blood vessels were taken down carefully with a harmonic scalpel. The necrotic bowel was then removed within a retrieval bag via a supra-pubic incision at the supra-pubic port site ( Figure 5 , Figure 6 ). Figure 5 Intraoperative photograph showing the removal of gangrenous small bowel within a retrieval bag by an extended suprapubic port site incision. 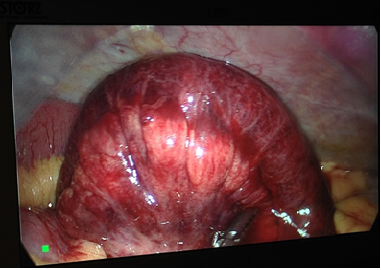 Extra-corporal side to side anastomosis of small bowel was performed with an endo GI 45 mm stapler. There was no iatrogenic injury to the bowel, colon, the blood vessels or any other organs and the blood loss was minimal. The patient had a successful post-operative recovery with minimal analgesic requirement and was discharged home on the 4th postoperative day ( Figure 7 ). 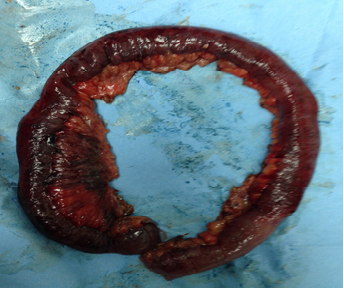 Histology confirmed the findings of a segment ischemic small bowel. 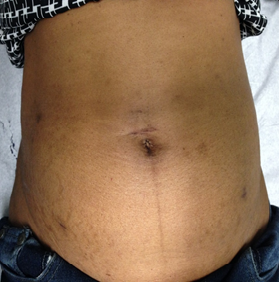 At two year follow up, our patient was doing well with no further abdominal complaints ( Figure 8 ). Laparoscopic surgery has gained its popularity not only amongst the surgeons but also to the patients, because of its unique advantages: (1) less postoperative pain, (2) faster return of intestinal function, (3) shorter hospital stay, (4) reduced recovery time; allowing an earlier return to full activity, (5) decreased wound complications, and (6) decreased postoperative adhesion formation 1 , 2 . Small bowel obstruction (SBO) is one of the most common causes of acute surgical admission. Mechanical small bowel obstruction, in particular the adhesion from previous surgeries, remains the predominant cause of SBO, accounting 60% to 70% of SBO 3 , 4 . The cardinal symptoms of small bowel obstruction are abdominal pain, vomiting, distension and constipation 5 . The severity of these symptoms is directly related to the degree of vascular compromise rather than to the degree of intestinal obstruction 6 . Clinical history may suggest the possible cause of SBO. After an accurate physical examination and the evaluation of WBC, Lactate, Electrolytes, BUN and Creatinine; all patients being evaluated for small bowel obstruction should have plain abdominal films. 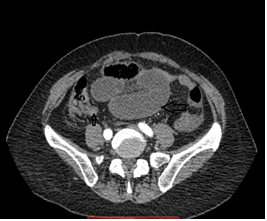 CT scan of the abdomen and pelvis should not be used routinely rather it should be preserved for the equivocal cases 7 . Prompt surgical intervention should be considered if there is CT scan evidence of any bowel ischemia as the longer waiting time before surgery is associated with increased risk of bowel resection 8 . The mainstays of management of adhesive SBO are initial trial of conservative treatment and if this fails, then proceed to either laparotomy or laparoscopy. However, for strangulating ASBO, open surgery is the preferred method of choice. On the contrary, the mainstay of management of non-adhesive SBO in a virgin abdomen is straight to surgery. Emergency laparotomy is indicated if there is sign and symptoms of acute abdomen with elevated WCC and CT scan evidence of free intraperitoneal fluid, mesenteric edema, lack of the “small bowel feces sign” and de-vascularized bowel 9 . However, this method of treatment should be reserved for selected cases only 10 . Diagnostic laparoscopy can play a vital role not only for the diagnosis but also for the treatment of selected cases of small bowel obstruction in a virgin abdomen. However, appropriate patient selection as well as the availability of a skilled laparoscopic surgeon is off paramount importance for a successful outcome 11 . Patients who are hemodynamically unstable and peritonitic with presence of free intra-abdominal air or gangrenous bowel are best managed with an open laparotomy. However, diagnostic laparoscopy can be a viable initial approach for patients without peritonitis and hemodynamic instability with a very low conversion rate of 8.7% 12 . Prompt surgical intervention should be performed as the success for early laparoscopic intervention for acute SBO is significantly higher when the duration of symptoms is shorter (24 h vs 48 h) 13 and also when the cause of SBO is a single band like our patient 14 . Intraoperative patient selection during diagnostic laparoscopy is now being recommended by the Italian panel of experts on laparoscopic adhesiolysis 15 . The only absolute contra-indication mentioned by these groups is those related to pneumo-peritoneum. They suggested that each case should be judged based on its own merit depending on the laparoscopic skills of the surgeon 12 . During diagnostic laparoscopy atraumatic grasper should be used and the use of cautery should minimize to avoid any inadvertent bowel injury. Grasping of the dilated bowel should be avoided and proceed cautiously by holding the mesentery. The bowel should be followed up in a retrograde direction from the ileo-cecal valve towards the point of obstruction, thereby reducing the risk of handling the already dilated friable bowel. Although until today, the literature has not yet documented a single case of emergency laparoscopic resection of gangrenous small bowel for SBO; the general principal of management of gangrenous bowel on laparoscopy is conversion to open resection 16 but this option should not be limited. 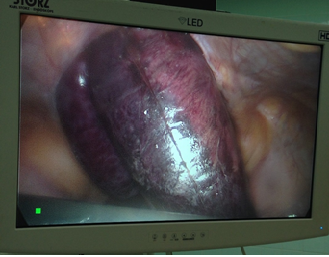 It can be done laparoscopically in selected patients as shown in this case report. The necrotic small bowel needs to be handled carefully and grasping of the necrotic bowel should be avoided at any cost to avoid spillage and to prevent further contamination. The necrotic bowel also needs to be removed in a retriever bag. A very low threshold for open conversion should be maintained at all the time 17 . Despite its unique benefit, laparoscopic surgery however, is not always risk free. It is associated with intraoperative enterotomies ranging from 3% to 17.6% 18 , 19 .One of the most dreaded complications of laparoscopic surgery is a missed enterotomy. However this can be minimized with meticulous handling of the mesentery rather than holding the friable bowel itself with an atraumatic grasper 20 . Laparoscopic approach can be attempted in selected patients with first episode of SBO and/or anticipated single band obstruction. Similarly, gangrenous small bowel can also be resected laparoscopically in highly selected patients in the presence of an experienced laparoscopic surgeon. A complete SBO should no longer be considered an exclusion criterion for laparoscopic approach. This case report hereby provides the first evidence for and is able to break the traditional dogma of mandatory open laparotomy for the resection of gangrenous bowel on laparoscopy. However, a very low threshold for open conversion should always be maintained. 1. Adhesive band (single) is a frequent cause of small bowel obstruction in virgin abdomen. 2. Surgery should not be delayed once there is clinical or radiological evidence of ischaemic bowel. 3. Laparotomy is an option but not always mandatory for resection of gangrenous bowel. 4. Laparoscopic resection of gangrenous small bowel is a feasible option in selected patients, in presence of a skilled laparoscopic surgeon. I was very concerned initially for the large scar on my abdomen when the doctor told me that if the laparoscopic surgery fails they have to do an open laparotomy by a long midline incision. Thanks to the Lord that my doctors were able to do the surgery laparoscopically. I would like thank my doctors for their great effort and I am very happy with my overall outcome. No fund was received to publish this article. The corresponding author will accept the full responsibility for the work. Di Saverio S, Ansaloni L: CHAPTER 7 Adhesive Small Bowel Obstruction. Updates in Surgery: The Role of Laparoscopy in Emergency Abdominal Surgery. Edited by: Mandalà V. 2012, Verlag Italia Catena F.. Springer .